May 3, 2018, 9:44 AM · When I said I had decided to perform the Telemann viola concerto from memory I was met with some skepticism. “A lot of soloists nowadays are using the sheet music." There’s a lot of overlap between shared experience and advice. It's a general human tendency to believe that the lessons of one's own experience are relevant for others too. But, as I’ve learned (from—ha—experience), it’s better to let the recipient decide how and why that is true. This blog is intended in that spirit. In my case, I need to memorize. In my day job, I am a neuroscientist. I worked for several years in biotech, then in academia as a project manager, and now in STEM education and outreach. I could go on, comparing different aspects of scientific and musical careers, but for now, this concerto performance is taking me back to my PhD thesis defense. At Stanford where I was a student, as at other major research universities, PhD candidates have to write a thesis, present their work in a departmental seminar, and then answer questions from their committee, which comprises several professors in the student’s field of research. My thesis committee members were intelligent and kind, and my thesis consisted largely of putting together three already-published papers and two manuscripts in preparation. I didn’t expect to fail based on my scientific work. But I did have these nagging thoughts that I could fail based on my presentation of that work. I had a history of performance anxiety and self-sabotage. There were the points lost from school reports because I read them verbatim from note cards. And the speech I gave for my failed run for student council. An All-State audition in which Mozart’s Violin Concerto #5 reduced me to tears wasn’t any better. And then came the worst one of all: the disastrous audition for the University Orchestra my freshman year in college that started me down the road to quitting the violin. But there was a glimmer of hope in grad school, and it lay in the results of memorization. A few years before my thesis defense, I gave my first talk at a major scientific meeting, the Society for Neuroscience meeting in Phoenix AZ. My 10-minute talk was scheduled, along with two others from my lab, in a session starting at 9 am on Monday morning. The night before, I paced an empty hotel conference room, memorizing my talk word for word. One of my lab-mates had suggested I do this. She was older than I, a postdoc and a rising star in the field, known for giving good talks. And she let me in on a secret: she still got nervous. Like, really, really nervous. But these talks were only 10 minutes, short enough to memorize, and that helped her. It might help me too. 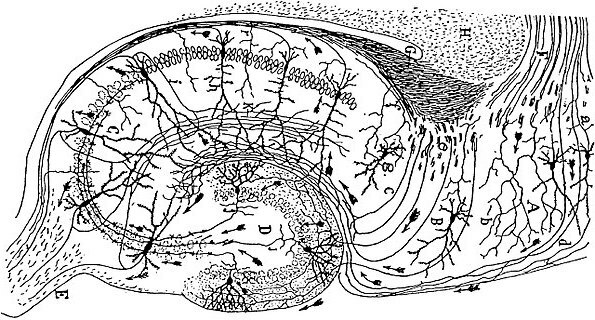 Cajal's drawing of the hippocampus, a brain structure important for memory. I had about 10 slides and so first I memorized the order of the slides, then I chose a visual cue on each that would remind me of the slide to come. When I changed to the next slide I oriented the audience to what they were seeing and then gave the slide's important message. Then it was time for the transition to the next one. This mental map of order of slides/visual cues/transitions/important message was something for me to hang onto and think about, even as the storms of anxiety raged. The next morning busses from the hotels were crowded and we almost didn’t make it to the convention center in time. With over 25,000 neuroscientists in attendance from all over the world, this conference is so big that only a few convention centers in the country can handle it, and this particular meeting took place before the Society figured out that Phoenix wasn’t one of them. The logistics were in disarray; attendees were packed into the ballroom like sardines without enough chairs and the podium lights weren’t working properly. My mentor was first from our lab to give her talk. I watched as the podium light went on and off randomly but she continued to speak calmly. The projector functioned, but there was no pointer available, laser or otherwise, and as she stepped back to the screen to point at something on one of her slides, she disappeared entirely. In the dark, she had missed the edge of the podium and fallen off. The audience gasped. She re-emerged, uninjured, climbed back up and finished her talk. Her voice shook but she got it under control. The podium lights came back on sometime near the end. The timing bell rang, people asked questions. And then I was next. I took the stage wondering what fresh hell awaited. My own talk went off without incident. The lights, and the laser pointer, and everything else were up and running by then thanks to the hardworking convention staff. I was hyper-aware of where the edge of the podium was. I knew my talk well. I’d just witnessed one of the worst things that could possibly happen during a talk, and I knew it was survivable. My friend's preparation, the fact that she knew her talk backwards and forwards, had made the difference. Several years later, when I was giving my thesis seminar, I had this experience to think back to. My seminar was about 5 times longer than the little 10-minute meeting talk, but I still approached it the same way: slides/visual cues/transitions/important messages. I just had more slides. I ran through them mentally, over and over again. The order was comforting; it was the stick I gave the trunk of my elephant brain to hold onto. Concertos don’t use slides or projectors to deliver their message, which is different from a scientific talk. But certain principles still hold true. First of all, having note cards, prompts, or the sheet music “just in case” isn’t going to work for me. If I know it's available I’ll lean on it. I’ll steal a look and then start reading it verbatim. Instead I need to be prepared to look inward, not outward, even--or perhaps especially--for that cue to keep going when I stumble. Of central importance is something that Meditation Instructor Eknath Easwaran called the stick for the elephant trunk. 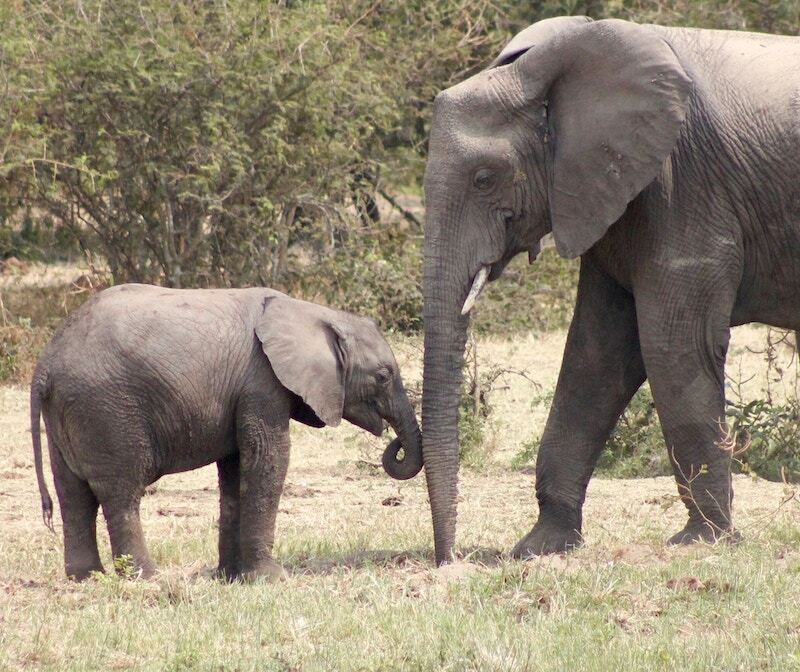 The human mind is rather like the trunk of an elephant. It never rests. It goes here, there, ceaselessly moving through sensations, images, thoughts, hopes, regrets, impulses. Occasionally it does solve a problem or make necessary plans, but most of the time it wanders at large, simply because we do not know how to keep it quiet or profitably engaged. Easwaran goes on to recommend the mantram, a spiritual formula in the form of a word or short phrase, to steady the mind. This is a subject of study for a lifetime. And I am not naturally a great meditator; sometimes when I try, it puts me to sleep. Furthermore, I find words themselves to be an awkward fit for a steadying mental substrate. My mind gravitates more towards deeper non-verbal sensory experiences: pictures, kinesthetic feelings, and music. It is those sensations that I string together as another kind of mantra. Not power point slides this time, but bridges, ladders, and lattices. Finger patterns, and arpeggios climbing to the sky before sliding back down the other side of the bow. The deep purple of the C, the forest green of the G, as I put bow to string. May 3, 2018 at 10:30 PM · Karen - Great descriptions - "The order was comforting; it was the stick I gave the trunk of my elephant brain to hold onto" and "Finger patterns, and arpeggios climbing to the sky before sliding back down the other side of the bow. The deep purple of the C, the forest green of the G, as I put bow to string." Very poetic! May 4, 2018 at 12:32 AM · Thanks! For some reason water and air metaphors work well for me in describing mental processes. 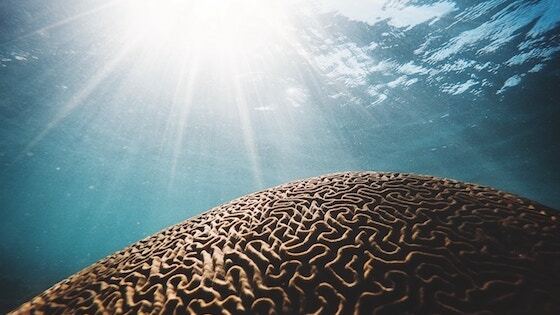 For all we learn about the brain, the subconscious remains deep and mysterious. May 4, 2018 at 12:24 PM · Such an excellent article! Thank you! May 7, 2018 at 01:53 AM · Fascinating article, Karen! I did have to laugh when I read, "And then I was next. I took the stage wondering what fresh hell awaited." May 7, 2018 at 04:02 PM · Drew, I'm glad you did laugh! I was trying to be funny. A friend of mine and I who worked in an office together used to say that to each other about grant deadlines and tasks that showed up at inopportune moments. "What fresh hell is this?" May 9, 2018 at 01:55 AM · Nice article Karen. That looks like immuno-peroxidase staining. I spent half of my life preparing those slides for pathologists. My short answer to "Why memorize" is; it forces you to really learn the piece. Now at age __ it seems to take 3 times longer, and harder.. For memorizing music I think there are 3 approaches; melodic contour, mechanical-theoretical, and visual, probably in three different places in the brain. I have only met one fortunate person who could memorize visually; see the page in their mind and play off that page. A theoretical approach to the opening of the Beethoven concerto would be; Dominant seventh chord on A in parallel octaves, that melodic fragment, broken thirds scale going down, etc. The melodic contour approach would be; I can hear the national anthem or yankee doodle in my head, so I can sing it, or play it, in any key. 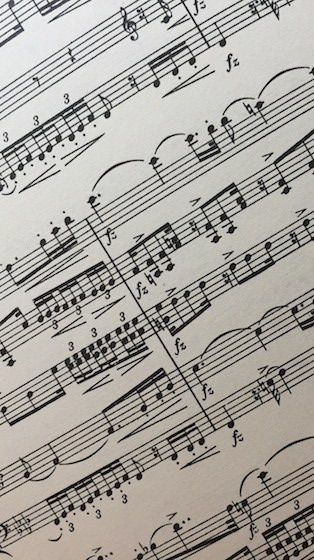 It is totally acceptable to play a modern concerto with the printed music, because hearing it internally or understanding its structure is really difficult. Music notation has a long history, invented as an aid to memory. May 9, 2018 at 02:50 PM · I'm not sure whether fresh hell or stale hell is supposed to be worse. May 9, 2018 at 04:39 PM · Joel, yes, that is immunoperoxidase staining. 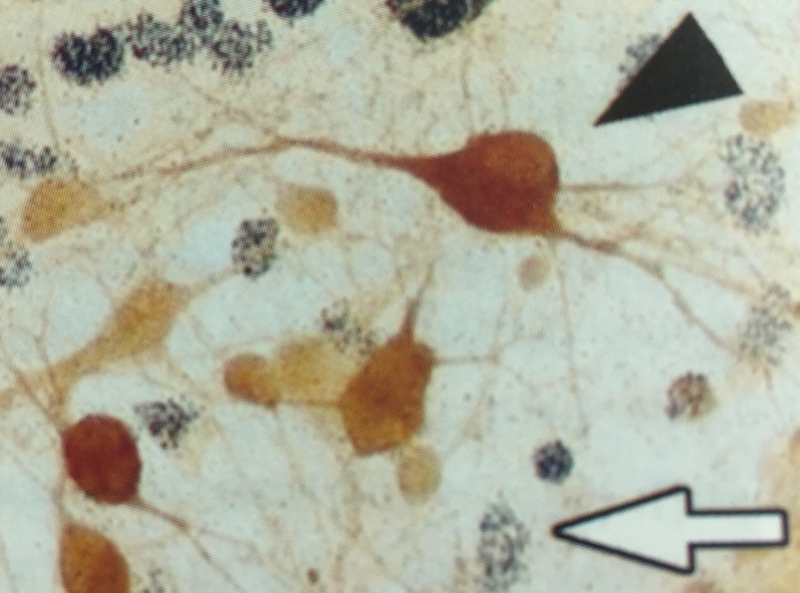 The marker is MAP2, which differentiates neurons from glia in cell culture. My teacher likes the theoretical approach and she is often breaking down the pieces I play into chord structdure. I find this useful to a point, especially when it gives me a name for something I hear/feel in my body, such as the resolution of a cadence. But sometimes having to remember and keep track of what key the composer has now modulated into is more of a distraction than an aid to memory. To your list of approaches I would add kinesthetic and metaphorical. For me the feel of a piece, where my limbs are in space and what the instrument feels like under my chin and between my fingers is a huge part of the experience of playing. And there are structures in the music that feel like mountains and valleys, like a topographic map. For example, the 2nd movement of the Telemann concerto opens with an ascending G-major arpeggio. That makes it feel like an entrance in more ways than one: it's like climbing the porch steps to the front door and ringing the doorbell.